When you are creating an outdoor space that is uniquely yours, you need a patio made of high-quality materials that will stand up to the test of time. As the leading patio contractors in Coram, NY, we offer the superior craftsmanship you need to make your dream patio a reality. If you are considering building a patio in your backyard, here are some benefits of taking your outdoor space to the next level with our patio services. Most importantly, patios are an amazing way to make your outdoor space a place where you can get away from it all. Imagine coming home from work and unwinding on your patio, enjoying the sun on your skin and the tranquility of nature with a beverage in hand. On the weekends, you can use your patio to host a backyard BBQ or have a relaxing dinner with your family. However you use it, your patio can be a relaxing escape very close to home. Like snowflakes, no two patios are exactly the same when you have them designed and built by Dimassi and Son’s. Whatever shape or size of patio you desire, we can create it for you, pairing high-grade materials and skilled craftsmanship to completely customize your patio to your specifications. 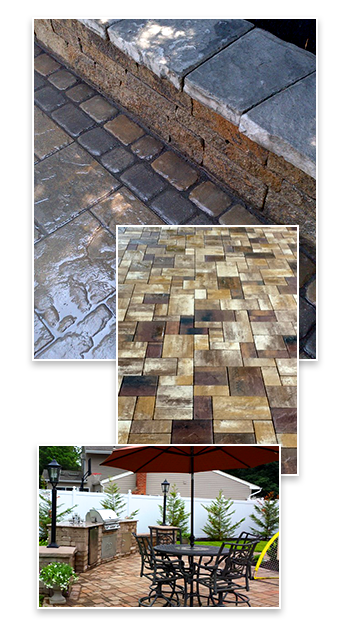 Whether you are looking for a natural stone, pavers, or brick patio, we can use the materials you desire to create the patio you have been waiting for. A gorgeous patio is a gift that keeps on giving. Just as you can enjoy it when you and your family live in your home, when you decide that you need a new space, your patio can be an incredible value add to your property. The money you initially invest in your patio will come back to you (and then some) when potential homebuyers are wowed by its beauty and function. If you are looking to add value to your property, a patio is a great choice. When you have guests over and you have a patio, you don’t have to be limited by your indoor space. A patio instantly adds more entertaining space to your home simply by making your backyard into a whole new room! If you love to entertain, a patio is a must-have. When you are looking for masonry contractors in Coram, contact Dimassi and Son’s. We can create the patio of your dreams to turn your outdoor space into the oasis you have always imagined.